I have been organizing my sewing room. Actually there may be a major destash going on in my etsy shop. Including some DS Hope Valley and AMH Garden Party and Good Folks. Anyone interested? Organizing means not so much sewing going on. Actually this is exactly where I found them. I'd like to say I have only been missing them for a day or two, but actually it's been more like a week. See? This is what happens when my surroundings are disorganized. It makes my brain disorganized as well and I can't think properly. I actually read an article on that once, about how the condition of your surroundings affects your mental status. But we probably don't need to delve much deeper into that today. I'm not getting ready to sew for Halloween. But Marmalade Fabrics came through again, as always, with a bolt of Kona black. I seem to be having a thing lately with solids and black backgrounds. It pays to be prepared. And Essex linen in "carrot"? Yes, please. It's beginning to look like spring in our yard. It doesn't usually get windy enough to turn this "weather vane," but she sure is cute. The one time in your life when chubby thighs are cute. I can't believe he is six months old already! I really like newly sharpened pencils. Haven't Ticonderoga No. 2 pencils been around forever? I must have gotten a bad box because with half of the pencils I sharpen, the lead gets loose and falls out. These pencils are super cute. I hope they aren't crap because I bought a whole package of 10 in the dollar bin at Target. I love those fun pictures! Here's the reason your pencil points fall out: when a pencil is dropped, the lead breaks inside, and when you sharpen to the break, well... Hope it was just the one pencil and not the whole pack! 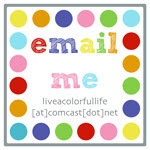 I'm interested in your destash. Did it sell already? Oooh, ooh, I'll take that Hope Valley off your hands!! Can we swap?? :) Love your scissors story, I have definitely done that myself many a times. Good luck with your organizing! I need to do some of that myself soon! I would be happy to take Garden Party off your hand! And I thought it was only drunk students that had road signs in their yards!! Fab random selection as always. BTW, WTH is that grey fuzzy thing in your tool caddy?! I would love to get the AMH Good Folks from you! Love that line! I can totally relate...I'm do disorganized that I tend to "lose" things when I try to organized...haha! Ooh, would love to see what you're destashing, esp the AMH good folks! 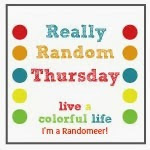 I'm the same - if my surroundings (particularly my sewing room) are cluttered and disorganised I feel overwhelmed and like I can't focus on anything until I've had a good tidy up! Hope the de-stash is going well! The postcards are just so adorable and love the picture of the two boys together, so cute! I get that same feeling when my creative space is in disarray. It's hard to focus. Looks like you had a few pairs of scissors in that caddy. I bet one of them would work to snip threads ;) Isn't it fun discovering new flowers in bloom this time of year! Happy days with the 6-month-old grand baby! That last guy looks like he would be more at home shopping at Walmart rather than Target! ;) I may need some of those pencils....love cute pencils! 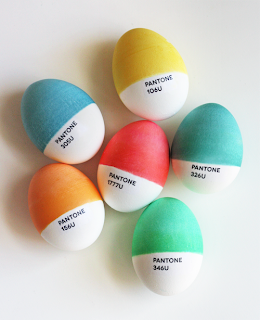 I love that Pantone egg photo. And I just learned about Marmalade fabric, myself. Next time I need linen, I'm going to order some and try it. ;-) Do you always buy fabric by the bolt? haha!